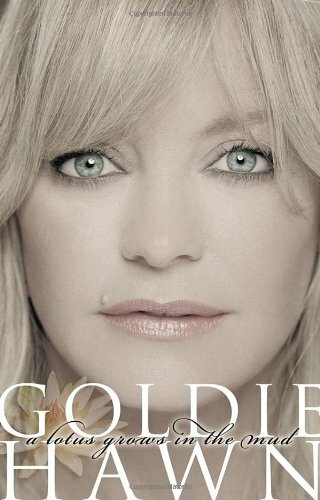 by Goldie Hawn | Biographies & Memoirs | This book has not been rated. I bought this from the fundraising bookshelves in the Bridge, the cafe within Gracious Street Methodist Church, this morning because I've long been a fan of this funny lady, it was being sold in a good cause, and because I aim to read at least two nonfictions a month, yet can't always being going for the serious stuff which this doesn't look to be . . .
Amazon Editorial Review: "With her trademark effervescence, Goldie delivers a personal look at private and powerful events that carried her through life: her father’s spontaneity; her mother’s courage; and the joy of being a daughter, a sister, a parent, and a lover. She writes about her childhood dreams of becoming a ballerina. She takes us on a tour of her go-go years in 1960s New York City, the phenomenon of TV’s Rowan & Martin’s Laugh-In, her Oscar-winning debut in Cactus Flower and Hollywood stardom. She writes intimately about the challenges of love, anger and fear, and the importance of compassion and integrity. She speaks openly about her family, her partner Kurt Russell, her children; her faith, her curiosity for that which she doesn’t yet know, and her thirst for knowledge. Most of all, it is a trip back through a life well lived by a woman well loved." Disappointing, very disappointing! I enjoyed it, finding it interesting and entertaining when she's writing about her life, career and family - but unfortunately she insists on telling us what her life has taught her, ending every chapter with a some sort of sermon . . . . and that definitely wasn't so good as far as I'm concerned! I don't read self-help books and I didn't appreciate this sort of self-help preaching masquerading as a memoir, although, to be fair, she does give a warning in her Preface! Some of it's a platitude, so obvious it's not worth making a song and dance about - and some of it's just whacky, New Age stuff . . . . Weird! We enjoyed a trip into York to enjoy the Christmas lights and decorations this afternoon and I took the opportunity to swap a couple of BookCrossing books at the same time!